What Can I Learn in an Online Master’s in Marketing Program? What Can I do with a Master’s in Marketing Degree? How Much Can I Make with a Career in Marketing? The work of marketing professionals can be found everywhere: from the billboard on the highway, to an ad on television, to branding campaigns on social media. If you’re interested in managing these kinds of marketing activities, an online master’s program in marketing might be a good next step. Find out how an online advanced degree in marketing can enhance your career path and increase your salary. Plus, find out which schools offer the best online programs in marketing. Finding the right master’s degree program can be a huge undertaking. In order to make the process easier, we have compiled a list of the best online master’s in marketing programs we could find by using data from the U.S. Department of Education and the Integrated Postsecondary Education Data System (IPEDS). In addition, we also considered published materials released from the schools themselves. Review the accredited schools below to find one that meets your needs. Students interested in obtaining a broad-based education in business while also entering or advancing their career in the field of marketing may want to consider the online Master in Business Administration with Marketing Concentration offered by Saint Leo University. Saint Leo's Marketing MBA program teaches students fundamental business principles as well as the marketing theories and concepts needed to work in such fields as sales, brand management, promotions, e-marketing and marketing research. Admission requirements for the Marketing MBA program include a bachelor's degree earned with a minimum overall GPA of 3.0 on the last 60 credits earned. Applicants failing to meet this requirement may be admitted with submittal of a GMAT test score of 500 or better. All applicants must additionally submit a resume demonstrating at least 2 years of professional work experience. To graduate, students must complete 36 credit hours of coursework. Full-time students taking 2 classes each 8-week term can complete their degree in as little as 1 year. Most students, however, take 1 class each term, requiring 2 years of part-time study to earn their degrees. All coursework can be completed 100% online. Students living near a Saint Leo Education Center (locations in California and 6 southern states) have the option of attending some of their classes in-person. 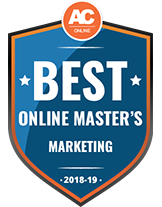 Private, Christian-affiliated Liberty University's 100% online Master of Science in Marketing program is designed to allow working students to earn an advanced marketing degree while maintaining their jobs and meeting their personal obligations. The program's curriculum builds on the student's unique knowledge and experience to develop the leadership, critical thinking and marketing skills needed to advance in their current careers or to explore other professional opportunities. Students can choose from among 4 specializations: Project Management, Sports Marketing & Media, Public Relations and Digital Marketing & Advertising. Earning the degree requires 36 credit hours of core business and specialization-focused coursework. The average program length is 1.5 years. However, students can transfer in up to 50% of the total credits required for graduation, significantly cutting degree completion time. Courses are presented in an 8-week, asynchronous format, allowing students to log in and complete their coursework according to their own schedules. Admissions requirements for LU's MS in Marketing include a bachelor's degree from a regionally accredited college or university earned with a minimum 3.0 cumulative combined GPA. Students must also have completed 27 credit hours of undergraduate coursework in a range of business-related subjects. Students failing to meet this requirement must take LU's Business Common Professional Core course once admitted to the degree program. Online students connect with university support services via the Office of Online Student Life. Support services include career and academic advisement, personal counseling, writing assistance, IT help and the online resources of the Jerry Falwell Library. In partnership with the Startup Institute, New Hampshire's New England College offers a Master of Business Administration in Digital Marketing, which can be completed 100% online. Based on the experiences of Startup Institute Alumni, the program is designed to provide students with important digital marketing skills in an immersive, fast-paced environment. Earning the degree requires completion of 28 credit hours of core business coursework in subjects such as Strategic Marketing, Managerial Accounting, and Finance for Leaders. In addition, students complete 3 Startup Institute "boot camp" courses (12 credit hours): Foundations of Digital Marketing, Branding Using Social Media and Marketing Immersion. The entire program is completed in 20 months. NEC's Pathways: Academic Success Services program offers a number of useful resources for students, including tutoring, academic advisement, and career and live planning services. Online students also have access to the resources of the H.R. Danforth Library. Admission requirements for the NEC/Startup Institute MBA in Digital Marketing include an undergraduate degree in business earned with a cumulative GPA of 2.75 or higher. Applicants also submit a resume. Applicants with a non-business undergrad degree may be accepted into the program if they have significant relevant work experience. Students interested in an education in business and a potential career in marketing may want to consider the Master of Business Administration (MBA) degree from Western Carolina University. WCU's MBA program allows students to create their own specialization by completing 3 courses in a chosen subject. The program currently offers 1 marketing course (Marketing Management). To create a marketing specialization, students can complete 2 additional marketing courses online or in-person at another accredited college or university (preferably within the University of North Carolina system) and then transfer the credits for those courses into WCU's MBA program to fulfill the 3-course specialization requirement. WCU MBA coursework is offered in an online/on-campus format requiring in-person class attendance every other week on WCU's Biltmore Park Campus, located just south of Ashville. Full-time students can complete the 36-credit-hour program with 3 semesters of study, while students pursuing their degrees on a part-time basis can expect to complete their degrees in 6 semesters. Admission into the WCU MBA program requires a bachelor's degree earned with a recommended overall GPA of 3.0 or better. Submittal of a standardized test score (450 GMAT or 300 GRE recommended minimum scores) is also required. The standardized test score requirement may be waived for applicants who have already earned a master's degree. The fully online Master of Science in Strategic Marketing available from Bellevue University, teaches students to design data-driven marketing programs that help companies achieve their financial goals, establish and grow their brands and gain a market advantage over their competitors. Graduates are prepared to pursue careers in a range of professional fields, such as market research analysis, management analysis and advertising sales. Admission into the MS in Strategic Marketing program requires a bachelor's degree (with minimum 2.5 GPA on last 60 credit hours earned) or master's degree (with minimum 3.0 on all previous graduate coursework) from a regionally accredited college or university (or equivalent). Earning the degree requires completion of 36 credit hours of coursework. Courses are presented in a cohort format in which students take 1 course at a time with the same group of peers and faculty from the start of the degree program through its finish. Bellevue offers distance learners access to wide range of support services, including academic and career counseling, IT troubleshooting, peer tutoring and writing assistance, as well as the extensive online resources of the Freeman/Lozier Library. Individuals with a keen interest in data gathering and analysis and a desire to advance their careers with a graduate degree in business may be interested in the Master of Business Administration with specialization in Marketing Data Analytics available from Colorado State University. This 100% online degree program teaches students how to craft specific marketing questions, gather raw data and, through the application of sophisticated analytic methods, provide empirical answers to those questions. In short, students learn to take raw data and transform it into actionable intelligence. CSU's MBA with Marketing Data Analytics specialization program requires 42 credit hours of core business and 19 credit hours of specialization-focused coursework featuring self-paced lectures with scheduled class assignments. The program can be completed in as little as 21 months, but students can take up to 5 years to finish their studies. Admission requirements include a bachelor's degree (in any major) from a properly accredited college or university earned with a minimum cumulative GPA of 3.0 and at least 4 years of professional work experience. Writing skills are evaluated through submittal of a resume and personal statement of purpose. CSU provides an extensive range of student support services, including academic and career advisement, IT technical support and access to the online resources of the university's Morgan Library. The Master of Business Administration with Marketing concentration available from Tiffin University is designed for working students who need the convenience of fully-online coursework and the flexibility of accelerated 7-week courses and full-time and part-time study options. Students can begin their studies on 1 of 6 starting dates offered throughout the year. Earning Tiffin's MBA with Marketing concentration requires completion of 20-24 credit hours of core business coursework and 12 credit hours of concentration coursework in the subjects of Information Systems for Marketing, Strategic Brand Management, Global Marketing Management and Marketing Field Analysis. Full-time students can complete their degree program in as little as 14 months, while part-time students should expect to devote at least 28 months to their studies. Admission into TU's online MBA Marketing program requires a bachelor's degree, 3-year professional degree or current enrollment in another accredited MBA program. Other requirements include an undergraduate minimum 3.0 GPA and completion of undergraduate courses in at least 8 business-related subjects. TU support services for online students include counseling services from the Career Services Center and IT assistance through the Information Technology Services Office. Delaware's private, nonprofit Wilmington University offers its Master of Business Administration (MBA) with a concentration in Marketing Management in a 100% online format. The degree prepares graduates for leadership positions at marketing and advertising firms, as well as with financial institutions, nonprofits and private businesses of all kinds. The program features accelerated 7-week courses in an asynchronous format to accommodate adult professionals working full time. To earn this degree, students must complete 7 core business courses and 5 marketing concentration courses in subjects that include Global Marketing Management, Market Research & Consumer Behavior, and Salesmanship & Sales Force Management. While most students complete the degree program in 2 years, individual completion times may be shorter or longer depending on the chosen course load and the number of qualifying credits transferred into the program. Admissions requirements for Wilmington's MBA with Marketing Management concentration include a bachelor's degree earned with specified coursework in mathematics, economics and accounting. Once admitted to the program, students move on to degree candidacy by completing 4 MBA courses with a minimum 3.0 GPA. Support services for distance learners at Wilmington include tutoring, career counseling, technical assistance and the online resources of the Wilmington University Library. The University of the Southwest, a private, 4-year interdenominational Christian institution, offers its Master of Business Administration in Marketing degree in a fully online format that allows students to complete their studies at their convenience. The degree program is designed for working adults interested in pursuing careers in advertising, marketing, promotion and sales in private businesses and non-profit organizations, as well as marketing and advertising agencies. Students complete a total of 36 credit hours of coursework consisting of 7 core business courses and marketing specialization courses in 5 subjects: E-Marketing; Information Technology for E-Business; Innovation Management; Small Business Marketing; and Organizational Design and Strategy (Capstone). The entire degree program can be completed in as little as 12 months. To be admitted in to the MBA in Marketing program, an applicant must hold a bachelor's degree from a regionally accredited college or university earned with an overall GPA of 3.0 or better. The degree need not be in business. Applicants must also submit a 500-word personal essay and professional resume. There is no GMAT or GRE requirement. Support services available to online students include academic, career and personal counseling, technology assistance and online tutoring. Franklin University offers a Master of Science in Marketing & Communication degree with coursework that can be completed 100% online. The program's marketing/communication dual-discipline approach allows students to develop their skills in a range of highly marketable areas, such as leadership and management, marketing strategy, research and analytics, brand management and digital media. The MS in Marketing & Communication program is designed with working adults in mind employing a 6-week course format. There are 10 courses in all and the entire program can be completed in as little as 16 months. Additionally, students can transfer in up to 12 qualifying master's-level credits. Admission into Franklin's MS in Marketing & Communication program requires possession of a bachelor's degree from a properly accredited U.S. college or university (or international equivalent) earned with a 2.75 minimum overall GPA. Applicants with a GPA average below 2.75 may be admitted with submission of sufficient GMAT or GRE test scores. Applicant references, work experience and other personal characteristics and qualities are also considered in determining admission. All Franklin students are assigned a personal adviser to help them develop their academic and career goals, schedule classes, review course choices and more. Other distance learning support services include tutoring, writing and research assistance and 24/7 online access to library catalogs and databases. Golden Gate University, a private, nonprofit institution, offers a career-focused Master of Science in Marketing degree that can be earned 100% online. Students learn to create and implement professional marketing plans, conduct market research, position brands and manage marketing budgets for private businesses, nonprofit organizations and advertising agencies. The degree is available with 3 concentrations: Digital Marketing, Marketing Analytics and an individualized concentration that allows students to customize a curriculum to meet their specific career goals. Golden Gate additionally offers a Master of Business Administration (MBA) with a Marketing Concentration, which is available entirely online. Hybrid format options are also available for both degrees. Credit hour requirements and program completion times vary by specific degree concentration and the individual student's chosen course load. Most students complete their degrees in 2 years or less. Admission requirements include a bachelor's degree and demonstrated writing proficiency. Admission details are available on the Admission Requirements webpage. Support services available to Golden Gate distance learners include academic advising, math and writing tutoring, and the extensive resources of GGU's Business Library. As marketing professionals advance in their careers, they need advanced skills to keep up with their job responsibilities. Students can expect to develop the following skills and knowledge when they enroll in an online master’s in marketing program. What’s the difference between a master’s in marketing and an MBA in marketing? Students enrolled in a master’s in marketing degree are generally expected to already have a marketing background—whether through work experience or an undergraduate degree program. As a result, these degrees are for people who already have a strong knowledge of marketing principles and want to build on their skills by exploring more advanced concepts. When students enroll in an MBA in marketing, they are not necessarily expected to have any prior marketing knowledge, but instead have experience in business. Since these programs do not entirely focus on marketing, they provide a broader view of business principles ranging from marketing to accounting to human resources management. What common courses are offered in a master’s in marketing program? Master’s in marketing programs can cover a wide range of coursework, and one program may have a different focus from another. Below are examples of common courses that can be found in these programs. Consumers can be unpredictable, so this class provides information that marketers need to make sense of the choices they make. The curriculum may cover recent consumer research studies, information processing and strategies for influencing behavior. In addition, students may gain an understanding of the economic, psychological and anthropological influences that may impact consumer selections. Students in this class learn about how integrated marketing communications are developed and implemented. To that end, professors may cover marketing tools, types of media, public relations and analytical procedures. Marketing analytics classes teach students about the quantitative tools professionals use in order to understand consumer preferences and perceptions. Concepts covered may include value marketing strategies, sales forecast development and competitive analysis. Marketing is examined through the lens of ethical principles and business law in this course. Students may learn about product liability, advertising tactics and competitive intelligence. This class explores how research impacts the decisions made during the marketing process. Students learn how market research studies are conceived, designed, implemented and interpreted. In order to provide hands-on experience, master’s degree programs in marketing generally require that students complete an internship where they apply the theoretical knowledge they learned to a workplace setting. At the end of the internship program, students write a report detailing their experience. What specializations are available in a master’s in marketing program? Since marketing is such a broad field, graduate programs give students the opportunity to become experts in specific areas of the discipline. The following are some of the specializations that students may choose to focus on based on their career aspirations. With more and more companies selling their products in foreign countries, it’s important for marketers to understand how to create campaigns internationally. Students in this concentration learn the principles of global marketing campaigns, how culture impacts consumer behavior and the trade laws that companies need to consider when doing business abroad. Students who are interested in overseeing the work of a creative team and managing campaigns from start to finish can enroll in this concentration. The curriculum may cover creating a budget and ensuring it is adhered to, the project selection process and crafting a realistic schedule. Students in this concentration learn the relationship between marketing and public relations and how these activities may differ. Coursework addresses consumer behavior, communication conflict and strategies for communication campaigns. It doesn’t matter how clever a digital campaign is if no one actually sees it. Enrolling in the search engine optimization specialization allows students to become well-versed in how SEO helps companies get eyes on their products. Specific subjects covered may include how to improve search engine rankings organically, effectively use paid search engine marketing tools and monitor search engine traffic with analytic tools. With so many social media sites out there, marketers need to understand how to be successful on each one. This concentration teaches students how to create social media plans for specific platforms, make decisions based on campaign results, and use social media tactics effectively. Whether students want to work for a multinational marketing firm or the in-house marketing team at a company, having a master’s in marketing degree can provide them with the foundation they need to build a successful career. The following are some of the job choices these graduates may pursue. Marketing managers monitor the conditions of an industry in order to determine potential customer segments for a particular product or service. In addition to working directly with a firm’s clients, they must work closely with colleagues in the product development and sales departments. Daily duties may include developing pricing strategies, negotiating contracts and hiring staff members. The marketing industry runs on data, and market analysts generate that data by studying sales trends and making predictions about how well a product or service will sell. Specific activities may include using statistical software to crunch the numbers, preparing reports and evaluating the effectiveness of a marketing campaign. These professionals are required to have strong verbal and written communication abilities, as well as critical thinking and analytical skills. Although the old saying tells us that no publicity is bad publicity, when bad publicity does happen, public relations managers step in to clean up their clients’ public image. In order to do this, they write and distribute press releases to media outlets, choose a spokesperson that will field media inquiries and determine the best way to persuade the community. In addition, these professionals supervise staff members in their charge. Organizations cannot be successful unless their customers are happy, so a large part of a sales manager’s job is focused on dealing with customer complaints and fixing problems to satisfy them. Also, these professionals assign sales territories to staff, review data to ensure goals are being met and price products and services. Marketing trends can change rapidly, so it’s important for professionals to always continue learning and networking in the field. One way they can do this is by participating in industry associations, which offer education courses, as well as opportunities to connect with other marketing professionals. The following are examples of some of the organizations people in marketing careers can benefit from. The AMA is dedicated to helping shape the marketing profession by nurturing the people who work in it. Members of the association can participate in local chapter events, attend training programs, and find work through their career resource center. The organization publishes several industry journals, including the Journal of Marketing Research, the Journal of Public Policy and Marketing, the Journal of International Marketing, and the Journal of Marketing. Serving construction industry marketers since 2009, this organization has been a training hub for those who want to develop the specialized skills this sector demands. Members can earn a Certified Construction Marketing Professional (CCMP) designation through the group, as well as get access to white papers, web-based training, a career center, and networking events. 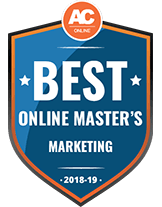 Marketing professionals who want to demonstrate their expertise to potential employers can earn a Certified Internet Marketer credential from this organization. The association also offers membership benefits like an annual conference, a newsletter, and networking events. This association, which is made up of practitioners and academics, offers training sessions with experts, regional networking events, and a discount on the group’s Social Marketing Quarterly Journal. There are also online forums where members can share information about jobs, resources to help them do their work more effectively, and social media news. A master’s degree in marketing can lead to a variety of career options. Here are a few positions that may be possible, though additional experience or certification may be needed. The future growth of jobs in the marketing sector will be dependent on several factors, according to the U.S. Bureau of Labor Statistics. One driver for the healthy occupational outlook of marketers is the Internet, which is continuing to increase opportunities for companies to market their products and broadcast news about their organization. As a result, more marketing opportunities will drive a need for more workers to research and analyze data to help ensure that campaigns are cost effective. Earning a master’s in marketing degree does not only train professionals for advanced positions, it also positions them to earn more money. The Center on Education and the Workforce reports that those with a bachelor’s degree in marketing can expect to make a median annual income of $63,000, but after earning a master’s, the salary potential jumps to $81,000 per year. Just as not every marketing campaign can successfully move a product, not every master’s in marketing program will give students the preparation they need to have a successful career. One way to increase the possibility of success is by choosing a school that is accredited. Accredited colleges and universities are required to be evaluated for their curriculum, research and professors. To make the best choice in programs, prospective students should look for schools that have been accredited by the Council for Business Schools and Programs (ACBSP), the Association to Advance Collegiate Schools of Business (AACSB), the European Foundation for Management Development (EFMD) or the International Assembly for Collegiate Business Education (IACBE). A master’s in marketing degree is a big investment, and oftentimes students need financial aid in order to enroll. Here are some possible financing sources. The first step students should take is to find out what kind of federal aid they are eligible to receive by filling out a Free Application for Federal Student Aid, or FAFSA. Not only does this help students receive federal loans and grants, it also helps them get placement in graduate assistantships. It’s worthwhile for students to pursue other sources of funding beyond federal financial aid. Oftentimes, the professional organizations that serve the community—like the National Retail Federation, Public Relations Professionals of Long Island, and Marketing EDGE—offer scholarships to graduate students. Many online master’s in HR programs may offer scholarships specifically for students entering their programs. For example, Yeshiva University automatically considers all graduate applicants to their M.S. in Marketing program for scholarships and assistantships.